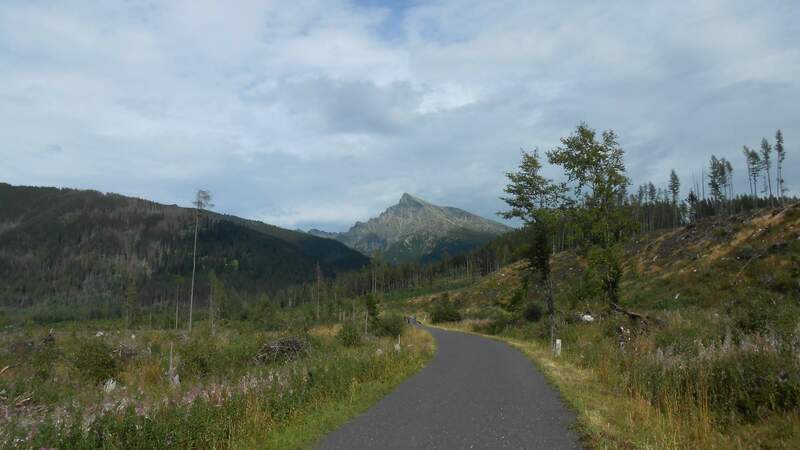 After the easier warm-up the previous day, I had something slightly more difficult ahead for the second day: the very long walk towards the ‘Hladké sedlo’ pass on border of Slovakia and Poland, which is (legally) accessible only from the Slovakian side. The reason for it was not just to test my endurance, but the potential sights. 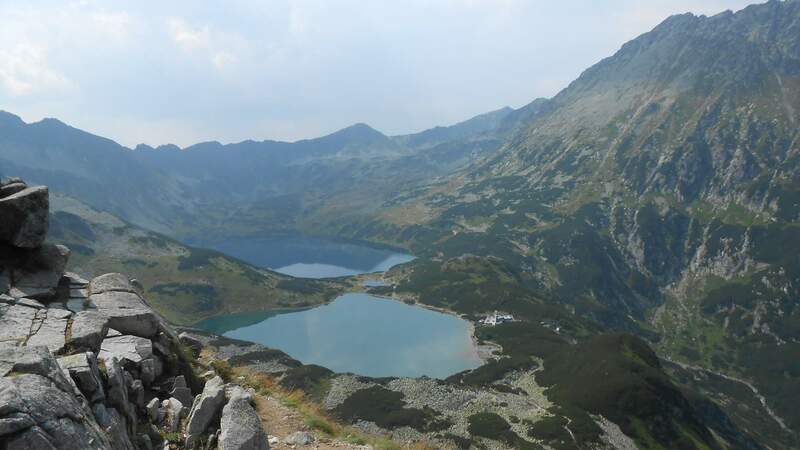 From the pass, the ‘Dolina pieciu stawu Polskich’ valley would be visible from bird’s eye perspective, with all its lakes. ‘Dolina pieciu stawu Polskich’ valley seen from overlook, 2015. The mentioned pass I was about to climb is to the right from the peak in central ride on the far end. Note: right-click (most of) the photos to open 2000x1125px version in new tab. My hopes for the sight were minimal from the morning as the weather continued the gloomy mood from the previous day. The bus dropped us at the ‘Tri studničky’ parking where I started climbing ‘Kriváň’ peak (elevation 2495 meters) in 2008. The peak itself made it on reverse of 1-cent, 2-cent and 5-cent Slovakian Euro coins and is easily recognized by its pyramid-like shape in the peak area. It resisted being eaten by the clouds for a while, but not too long. My first steps were the same as in 2008. 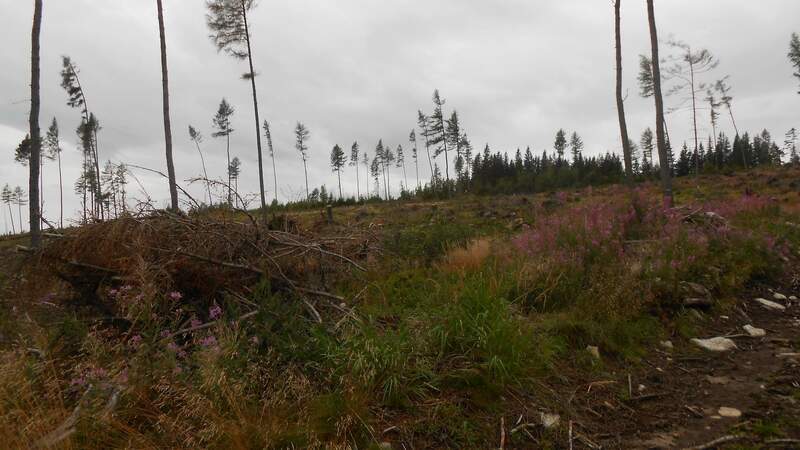 The land still did not fully recover from the wind storms in 11/2004 and 2/2014 which levelled the forest in a strip up to 3 kilometres wide. 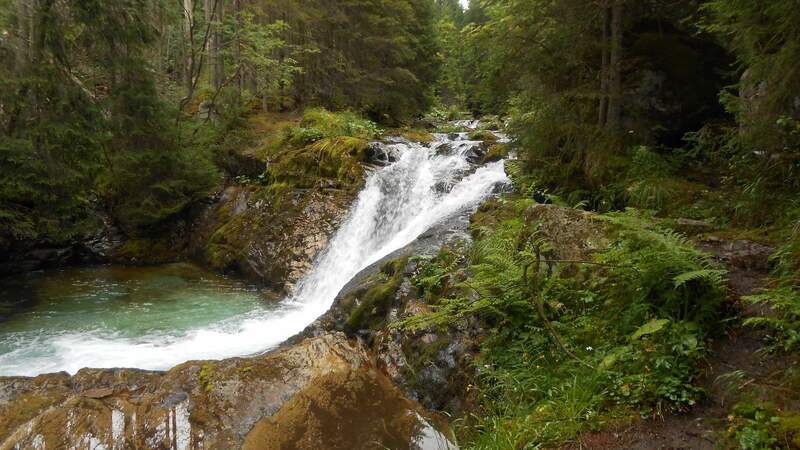 My father told me about how the lush spruce forests were all around and prevented seeing the imposing peaks, which delayed “where the hell I am going” thoughts, to which I am mostly immune anyway. This place was lush spruce forest before late autumn in 2004. The hike started at 8:15. After short ascension followed by likewise short descent, we reached the valley. This time I was almost alone, my only company was probably the most experienced person of all those who were there and despite being among the oldest here, most people of my age would have trouble keeping up with her. The fact that we were the only doing this (apart form one more that went his own version with local friends) tells much about how insane this hike might be, even if only in distance. After some 6,5 kilometres of walk we reached the first interesting place, ‘Kmeťov vodopád’ literally translated as ‘Old man’s waterfall’. It is a few meters to the side on a brook that feeds into the main valley shortly after. After a while trying to take decent pictures of a waterfall that is not even completely visible as the steep slopes take a turn, we continued through the valley. The road, from here made by low-quality asphalt, turned to rocks from there on as we followed the river for four more kilometres. By that time, we ascended to elevation around 1500 meters, leaving us with 500 more to ascend. Shortly after, the path started zigzagging on the slopes, quickly gaining altitude to some 1700 meters. 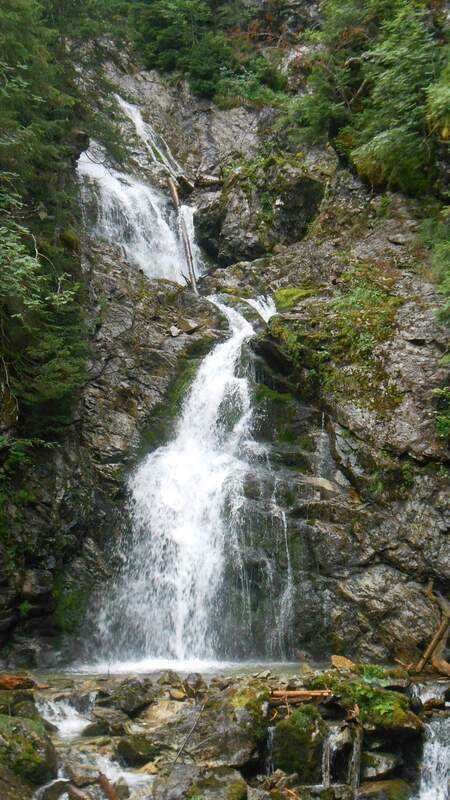 We could see another waterfall on the opposite side of the valley, on a river flowing from the lake on the valley’s end. 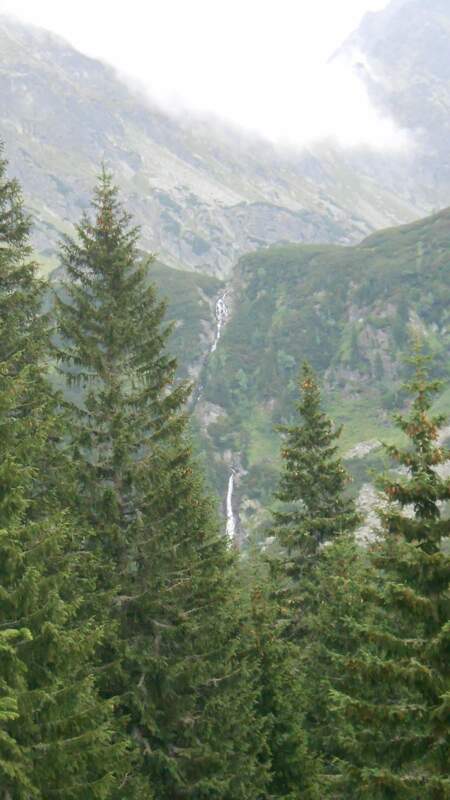 Waterfall seen from a distance. Taken with 5x zoom in high humidity, the photo is not ideal. By the time this ascension was done, we were reached by the clouds and covered by a bit of light rain or heavy mist, I was unable to find the difference. This time I did not wait with using waterproof jacket and the cold water eventually forced me to dig the depths of my backpack for gloves, as since some 2010 I always carry at least the thinnest ones even in summer. The ascension slowed down for quite a while, the trail leading some distance from small and shallow lake. Eventually we ascended one more into ‘Sedlo Závory’, the lower pass. 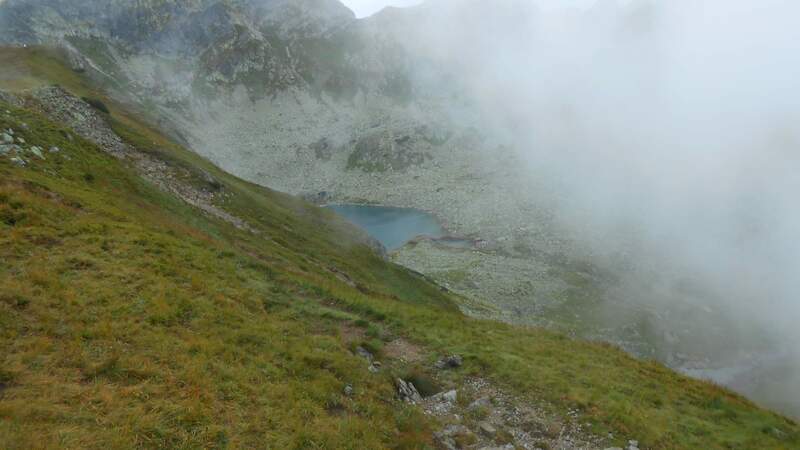 After short break, we continued to the upper pass, to confirm that my hopes were taken by the clouds. The clouds moved around, allowing a short peek through here and there. Originally intending to leave at 12:00, I extended the ultimatum by five minutes, and it paid off. Peaks in Polish side of the mountains, shrouded by clouds. Uppermost lake in the valley, visible for maybe 10 seconds. As if the clouds feared crossing the border, they seemed to stop there. It was sign of better days to come. By the time our descent to the second valley was half-done, there was little trace of them and eventually the clouds were mostly far higher than we were, except some valleys that were out of reach anyway. At 13:45 we reached the valley. We had 12 km of walk on asphalt ahead, something we could do in two hours or less if we pushed it. The bus was scheduled to pick us up at 18:15, so there was enough of reserve. 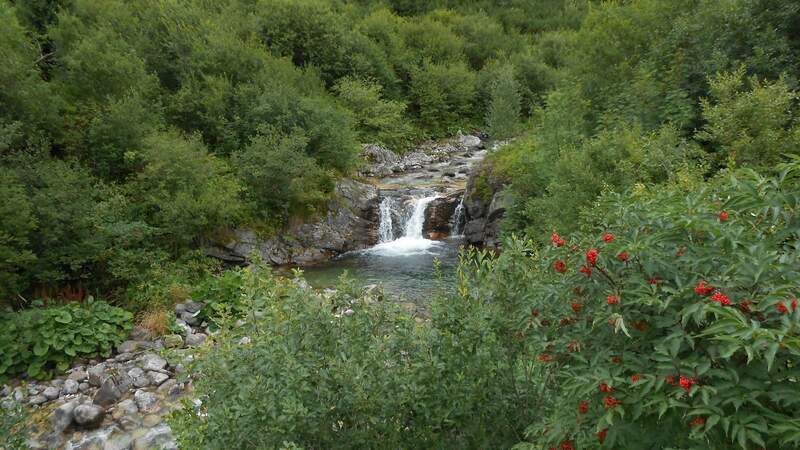 We took a small break at a nice place, with overlook above another small waterfall. By that time, we’ve already covered distance of 19 km. While I thought that nothing bad could happen, I was given harsh lesson. Some two or three kilometres later, I was slowed down by harsh pain and cramps in my left leg in the place where the muscles connect to Achilles’ tendon. The pain went after a few minutes of slower walk, but it was definitely not a pleasant feeling. The next seven or so kilometres were uneventful. 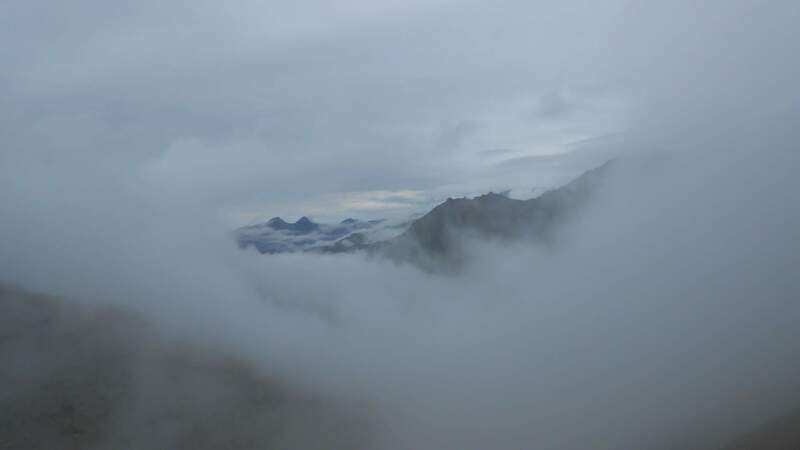 Skies continued clearing and visibility improved to the degree that we could see Kriváň in front of us as our journey neared completing the upside-down U shape. Shortly after, I had the last bad luck surge in the whole holiday. Not only the batteries in my GPS receiver gave out, so my track log misses the ending, but the cramps returned with a vengeance. Even with this hindrance and the fact that my hike ended in weird limping, we reached the destination at 16:10, giving us one hour advantage over map time. Following the intense pain, I took some minerals to ease it and decided that I’ll take the next day lightly if possible (because I am not often seen doing that).